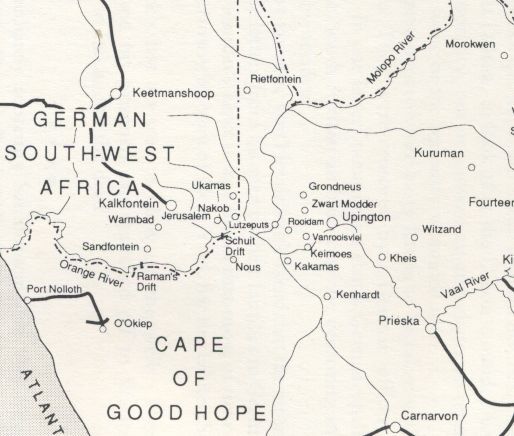 South African forces have invaded the German colony of South West Africa. After a series of defeats the Germans retreated to Khorab in the north of the country. Here they hoped to fortify their positions and hold out against the South Africans. To buy time, German commander Victor Franke left a rearguard at Otavi to delay the South Africans. Unfortunately for the Germans, the South Africans were able to chase away the Otavi rearguard and resume their swift advance. Now they are on top of the main German force, who have not had time to prepare their defences. The Germans find themselves surrounded. Rather than have his men attempt a breakout, Franke agrees to surrender. Louis Botha, South Africa’s prime minister, personally commands his countrymen at Khorab. He hopes that when the war is over South Africa will be able to maintain its control of South West Africa. Unusually for fighting in Africa, the South West African campaign appears to have been a white man’s war. 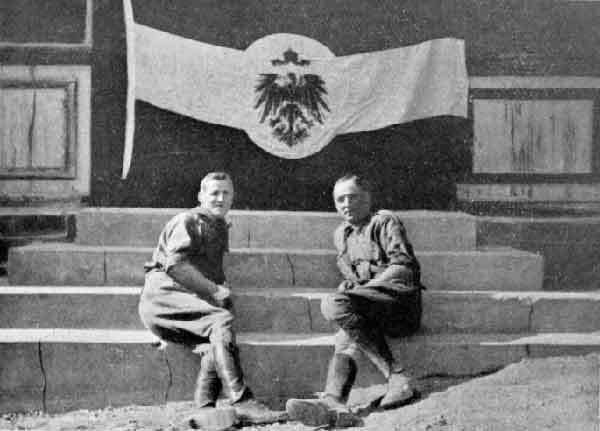 The German forces were composed of regular German soldiers or settlers from the Fatherland while the South Africans fielded troops recruited from the white minority. Partly to prevent trouble with South West Africa’s native population, Botha permits the German settlers to retain their weapons and return to their homes. German forces in South West Africa are coming close to collapse. South African columns are rampaging across the vast arid colony, carrying all before them. German forces have retreated to the north of the colony, but the South African are in hot pursuit. The Germans hope to build a strong fortified position at Tsumeb. To buy time, a rearguard is left to hold off the South Africans at Otavi. The Germans under Major Hermann Ritter have some 1,000 men to hold the line at Otavi. The mountainous ground is favourable to the defence. However, the South Africans, under General Louis Botha, their prime minister, have more than three times as many men. Travelling on horseback, the South Africans are able to move quickly. They overawe the Germans, who break without offering serious resistance. African battles are often puny affairs by the standards of fighting in Europe, but Otavi is an especially bloodless affair, with total casualties of only around 20. Yet the battle is decisive. The way is now clear for the South Africans to race on to Tsumeb and hit the Germans before they have time to build up their defences. German forces are still holding out in Kamerun, South West Africa and German East Africa, but in South West Africa it looks like they will not be holding out for much longer. South African forces are advancing into the colony from the south while further north they have also been pushing inland from Walvis Bay (a South African enclave). 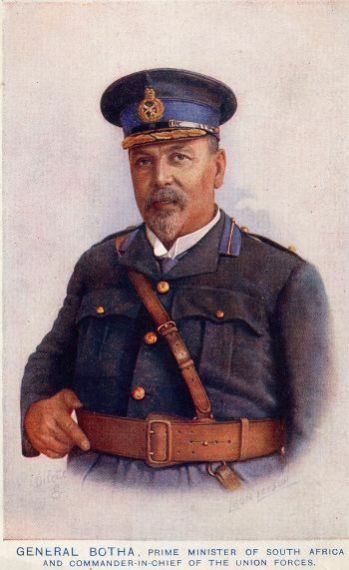 Louis Botha, South Africa’s prime minister, is personally commanding the northern force. Not too long ago he was leading resistance to Britain in the Second Boer War. Now he leads his countrymen against Britain’s enemies, partly because he wants to establish South African control over South West Africa. Today Windhoek, South West Africa’s capital falls to Botha without a fight. Germany’s vast colony is effectively cut in two. John Chilembwe’s rebellion in Nyasaland is over. The British colonial authorities moved swiftly to crush the insurrection and the revolt failed to attract mass support, never expanding beyond Chilembwe’s small group of associates. Chilembwe himself is killed while trying to escape into Mozambique. Many of his followers are summarily executed while others are taken into custody, for later trial and execution. The British also apply collective punishment against people in the area of the uprising, burning huts, confiscating arms and levying fines regardless of whether or not a person had been involved in the revolt. Because of Chilembwe’s millenarian Christianity, the authorities also shut down African churches operating outside white supervision. In South Africa Manie Maritz’s pro-German Boer revolt is also over. Maritz himself is luckier than Chilembwe and manages to flee South Africa. His fellow insurgents surrender. The South African authorities treat these white rebels with greater leniency than Chilembwe’s comrades; the Boers are fined and imprisoned but not subjected to summary or judicial execution. With these rebellions crushed the way is increasingly clear for an advance against the German colonies in southern Africa. Perhaps sensing this, the Germans in South West Africa decide to pre-empt the enemy by mounting their own mini-invasion of South Africa. At Kakamas the Germans clash with a South African force. Compared to European battles, this is little more than a skirmish, but the Germans are defeated and forced to retreat. South Africa has despatched a force to Walvis Bay, its enclave port in German South West Africa. Now this force makes a modest first step towards the conquest of the enemy colony, capturing the nearby German port of Swakopmund. Little resistance is encountered. In Europe some soldiers may be putting aside their differences and enjoying temporary truces with the enemy but in Southern Africa the war continues as usual. Attempts by South African and British forces to invade Germany’s colony of South West Africa have thus far proved unsuccessful. In September the Germans defeated an invasion force at the Battle of Sandfontein. South Africa has also been convulsed by the Maritz Rebellion: a revolt of pro-German Boers, named after its leader, Manie Maritz. The rebels want to remove South Africa from the British Empire and hope to do so with the aid of the Germans. The rebellion has distracted the British and South African loyalists, as they do not want to send forces into South West Africa and leave the rebels a free hand in their rear. The rebellion continues but the authorities now have it largely under control. Maritz himself has fled to German territory. With the situation in South Africa no longer critical, attention is turned once more to South West Africa. 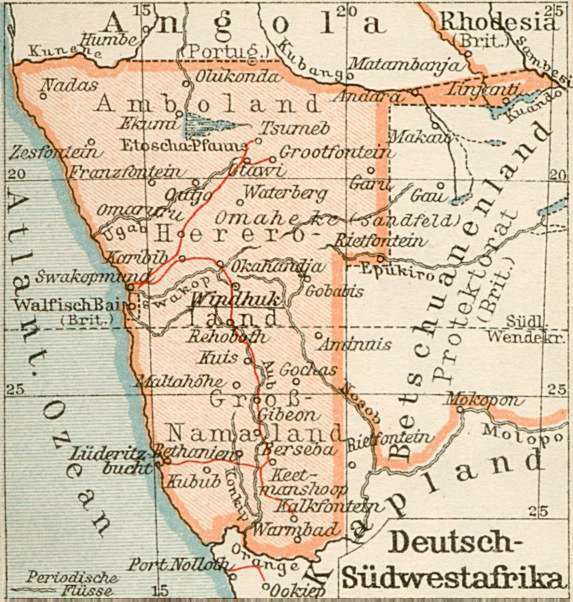 South Africa has an enclave in the middle of German territory: the port of Walvis Bay (shown as Walfisch Bai on the map above). To put extra pressure on the Germans, a South African strike force lands here today. The plan is for this force to hit the enemy in the middle and north while another thrust is made across the border from the south. When Britain went to war with Germany, its overseas dominions did too. One of these is South Africa, from which British and South African troops prepared to invade the neighbouring German colony of South West Africa. But South Africa is restive. The Afrikaaners there remember the moral support Germany gave them in the Boer War. Many of them feel that they would be better off joining with the Germans and trying to overthrow British rule. A Boer revolt is led by Manie Maritz. It attracts some support but not so much that it distracts the British from the main goal of invading South West Africa. However, when British and South African clash with the Germans in the arid borderlands near Sandfontein, the heavily armed Germans inflict a crushing defeat on the would-be invaders. The survivors limp back into the heart of South Africa.